This is the current timetable for the Spring 2019. These workshops are usually held at the weekends- Saturday or Sunday at my studio in Harrogate. If you have a small group of friends that would enjoy a particular class on another date, I am happy to look at arranging this with you. Just get in touch for a chat about your requirements. Thank you. This is a one day introductory workshop for beginners. You will learn to cut glass safely and competently, grind glass, copper foil, solder and finish your project to take home. By the end of the day you will have created a beautiful stained glass light catcher to hang in a bright window. The cost includes all materials and tools you will need for the day. The teaching group is small so you will get plenty of help and support throughout the day. Lunch is also included. January 12th, Feb.24th, March 23rd, April 13th, May 18th, July 13th 2019. 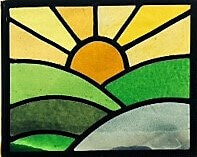 This is a one day introductory workshop to traditional stained glass leaded work. It helps to have done a copper-foil workshop day, but it’s not absolutely essential-really!. 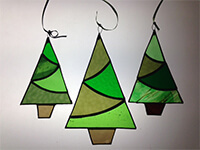 You will learn the basic skills needed to create your own small leaded panel (around 10 pieces of glass) that you can take home at the end of the day. The cost includes all tools and materials you will need.There is a selection of tried and tested patterns for you to choose from in the studio. It is a very busy day and you will be on your feet for most of it and it would be wise to bring along an apron. Lunch is included. This is a one day workshop for beginners. You will learn to cut glass safely and competently, grind glass, copper-foil, solder and finish your project to take home. By the end of the day you will have created an original stained glass light catcher that will hang beautifully in your home. The cost includes lunch, tuition, materials and tools that you will need for the day. There will be patterns in the studio for you to choose from and as the group is small, you will get plenty of help and support throughout the day. 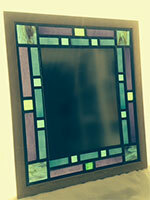 This one day workshop involves traditional leaded work to create a bespoke stained glass mirror. It is helpful to have already attended a previous course so that you have a feel for cutting glass and using lead to assemble pieces, but this isn’t essential as you will plenty of opportunity to practise. You can design your own stained glass borders around the mirrored glass that will be housed within an oak frame. 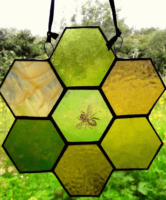 This is a creative half-day workshop, where you can make a stained glass honeycomb light-catcher to hang against a bright window. It is perfect for beginners. You will be cutting glass, grinding, copper foiling, soldering and embellishing your creations. A great introduction to the wonderful craft of stained glass. A creative stained glass day employing the flexible skill of copper-foiling to make some original Christmas decorations (or gifts!). You can create your own designs or use some of the “tried and tested” ones at the studio with a Christmas theme. Good fun, with carols and mince pies a plenty! Lunch is provided too. Perfect if you fancy giving personalised hand-made gifts.